The origins of Ragdoll cats are full of myth and controversy. This cat’s history is often contradictory and confusing; some of the Ragdoll story is just not possible. Other parts we know to be factual. First things first: the Ragdoll cat breed started in California back in the 1960s. It was founded by a woman named Ann Baker. The very first cat of this breed was for all intensive purposes a regular cat named Josephine. Ann Baker noticed something special about Josephine and her offspring. She decided to breed for this characteristic. Ragdoll cats get their name from the fact that they go limp like a Ragdoll when held. Ann Baker went so far to trademark the term Ragdoll; anyone who bred Ragdoll cats had to pay her royalties to use the name. 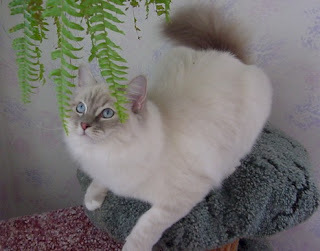 It is for this characteristic of the Ragdoll cat breed that Ann Baker made her unusual claims. Josephine was once hit by a car. On one account Ann Baker claimed she had taken the injured cat to a local University to have her patched up; she asked the University to give her cat new DNA and this is why Ragdoll cats came to be.